The duel on Twitter was triggered by Mr Abdullah's tweet in which he took a swipe at Mehbooba Mufti's father Mufti Mohammad Sayeed. National Conference's Omar Abdullah and Peoples Democratic Party (PDP) chief Mehbooba Mufti exchanged barbs on Twitter today, over the Jammu and Kashmir government's order for its employees that made attendance compulsory on Republic Day. The duel on Twitter was triggered by Mr Abdullah's tweet in which he took a swipe at Mehbooba Mufti's father Mufti Mohammad Sayeed -- the former Jammu and Kashmir chief minister who died in 2016. Mr Abdullah claimed that similar orders were passed by Mr Sayeed during his regime. "Please correct me if I'm wrong here but this isn't the first time. Attendance has been compulsory in the past as well. In fact late Mufti Sb (Mufti Mohammad Sayeed) used to use state transport/police vehicles to bring supporters to show how much the situation was 'improving'," he tweeted. Ms Mufti said the accusation on her father who wasn't around to defend himself was beyond the realm of discussion. Mr Abdullah said he was stating a fact. The two chief ministers are known for taking their political fight to Twitter. The bone of contention this time was the order to state government employees to be present at Republic Day celebrations. Failure to attend the ceremony would count as negligence of duty and disobedience of government instructions, the order said. The BJP pulled the plug on the Mehbooba Mufti government in June last year over differences in their uneasy alliance. In November, Governor Satya Pal Malik dissolved the state assembly after rival claims to form government from former Chief Minister Mehbooba Mufti and People's Conference leader Sajad Lone, who was backed by the BJP. Ms Mufti had claimed her party had the support of arch-rival Omar Abdullah's National Conference and the Congress. In December, after six months of the Governor's rule, the state came under the President's rule. 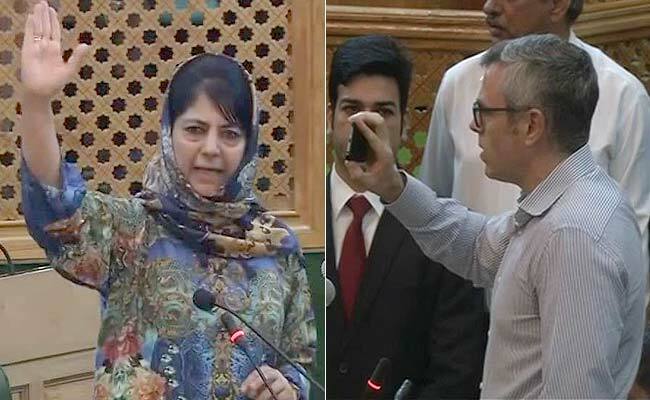 Both-- Mr Abdullah and Ms Mufti-- have been demanding that the elections to the state assembly should be announced.